Every day we make countless snap decisions without realizing it. At any moment, you’re faced with 11 million pieces of information, but your brain can only process 40 of those bits at a time. So it creates shortcuts. Unfortunately, those shortcuts—or habits of thought—can lead to errors and less-than-ideal choices. A few years ago, YouTube launched a new video app for the iPhone. Within days, they began receiving complaints that the videos were upside down for many users. It turned out the design was based on an unconscious bias. Everyone on the design team was right-handed. Without realizing it, the developers had created an app that worked best for right-handed people. Unconscious bias produces blind spots that affect all our choices in subtle and sometimes disturbing ways. Biases are based on all kinds of factors. Perhaps most prevalent is race. In a study by two Harvard University sociologists, real people were sent on job interviews for low-wage jobs. They were all given the same interview training and identical resumes. The finding was that black applicants with no criminal record were offered jobs at a rate as low as white applicants who did have criminal records. There’s evidence that gender is another leading factor in bias. A well-known study out of Yale University asked a panel of judges to rate two resumes. The panel had nothing to go on but the piece of paper. The resumes were identical in every way, with one exception: one had a man’s name at the top, the other a woman’s. The panel members, male and female alike, rated the male candidate as more qualified. They were even willing to pay the men a higher starting salary. Researchers have found evidence of bias based on a myriad of factors from sexual orientation to height to weight to facial characteristics. Our values can cause biases. Our thoughts and feelings are based on our values. 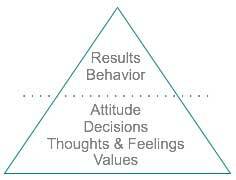 Those thoughts and feelings drive our decisions and attitudes, then our behavior and the results we produce. The things we say, do and achieve—shown above the dotted line–are visible. But they’re just the tip of the iceberg. Everything below the dotted line is invisible. The more we know about what’s below the surface for ourselves, the better we understand ourselves. In our work with generational values, we’ve found that each values group has its own filters—and that those filters come with biases we need to be consciously aware of. Those with WWII values tend to see the world through the filter of tradition. As a result, they can have a bias against people and ideas they perceive as new and different. If you have WWII values and you’re not aware of your biases, you may not team up well with someone whose appearance is nontraditional. You may reject out-of-hand a promising new program that isn’t in keeping with the way things have traditionally been done in your organization. Many years ago when he was just in his early twenties, our friend Jim Mitchell was promoted to the marketing staff at the Head Ski Company. In weekly meetings, his suggestions seemed to meet a wall of blank resistance. No one seemed to be taking him seriously. Then he took a vacation. While he was gone, he grew a moustache which made him look three to five years older. When he returned, he was amazed to find how differently his suggestions were received. “Hey, good idea, Jim,” his colleagues would say. “Let’s look into that.” It’s likely that bias against the younger-looking guy had been getting in his way. Those with Baby Boom values tend to see the world through the filter of team. If you have Baby Boom values, you may unconsciously tend to introduce ideas, solve problems, and generally get work done in teams, forcing people who are actually most effective on their own to work in ways that aren’t natural for them. You may have a bias against independent operators when, in fact, loners can bring valuable insights and even make great team members—if there’s a willingness to honor and adapt to differences. A consultant we know is a marketing whiz who works on his own as an independent contractor. Recently, he was asked to serve on the board for a first-rate orchestra that was having problems. Attendance was down. Fund-raising was down. The board members had served together as a team for 6 to 12 years, so they thought they needed new blood. Within 60 days, he had delivered a dynamite marketing plan with goals, strategies, timeline and action plan. But the board members rejected it without even giving it a good look. One of them told him they didn’t like his plan because he hadn’t spent “friendly” time socializing with them before, during and after meetings. It’s likely their bias against loners got in the way. People with X values tend to see the world through the filter of results. If you have X values, you may not be on board with an idea because you just don’t see how it effects the bottom line. We know a young woman who works for a start-up pharmaceutical company that is on the verge of running out of their first round of venture capital. Because time is running out, the focus is totally on results—and delivering those results on time. The small staff works in silos, each individual responsible only for their own piece. The young woman says that when she asks someone for help, they inevitably respond that they’re sorry, but they’re too busy to help. When she suggests getting together for lunch, they say they’re taking lunch at their desks. The hard-driving push for results is creating a tense atmosphere and low morale. There are things that may not contribute directly to the bottom line but that contribute to the overall well-being and emotional IQ of an organization. Those with Millennial values tend to see the world through the filter of positivity. If you have Millennial values, you may have a bias against people with a more skeptical approach. A bias for positivity and a tendency to discount the downside may have contributed to the space shuttle Challenger disaster in 1986. Designers of the shuttle’s O-rings knew they weren’t likely to withstand unusually cold conditions, but they focused on the dream and didn’t dwell on worst case scenarios. On the cold morning of the launch, the O-rings froze and broke apart, leading to the disaster. Perhaps a nay-sayer who had focused on every single possible thing that might go wrong could have prevented that tragedy. There’s a role for the skeptic. They serve a purpose organizationally. A pragmatic, hard-nosed approach can bring balance. When we see the faults in things, we’re better able to improve them.